Meanwhile, the commercial fishing industry was sized at $241 billion in 2017, having expanded by 2.3 percent from the previous year. If these growth rates continue, then the aquaculture industry is set to surpass commercial fishing by 2026. The rise of aquaculture may hold promise to mitigate the environmental pressures of overfishing wild populations, and the food scarcity issuesresulting from the rising global consumption of fish. However, to achieve these benefits, the aquaculture industry’s growth must be coupled with an increase in sustainable practices. Investors have a vital role to play through their power to reallocate funds away from unsustainable forms of aquaculture. This means avoiding businesses who are using fishmeal from juvenile fish or illegal by-catch, making heavy use of antibiotics in their fish stocks or creating significant wastewater discharges that threaten biodiversity. To finance the sustainable aquaculture revolution, investors must be able to define sustainability in aquaculture, address current barriers to investment and identify impactful investment opportunities. Key players who are making this possible by providing solutions to support and scale sustainable aquaculture include Hatch, Alimentos Ventures, Aqua-Spark and Coastal Enterprises, Inc. (CEI). Dr. Carsten Krome is the CEO and co-founder of Hatch, the world’s first accelerator program focused on the aquaculture industry. He also heads Alimentos Ventures, a venture capital firm based in Germany that invests in innovation in aquaculture feed, health, genetics and technology—with a focus on early- and pre-seed stage companies. According to Krome, the concept of sustainability in aquaculture “is problematic, as people assume because we are in aquaculture we are already sustainable.” Indeed, many parts of the aquaculture supply chain are prone to detrimental health and environmental impacts if managers don’t prioritize sustainable practices. Excessive antibiotic use in farmed fish could affect human health, for instance, and uncontrolled waste generation can damage surrounding ecosystems. Thus, investors looking to make a positive or net-zero impact must consider the intricacies of the aquaculture supply chain. Mike Velings is founder and managing partner at Aqua-Spark, a global investment fund based in the Netherlands. The group seeks to invest in sustainable aquaculture businesses that generate returns alongside positive social and environmental impacts. Nick Branchina is the associate director of fisheries and aquaculture at CEI, which provides advisory services and financing to fisheries and aquaculture businesses in Maine. Branchina highlighted how certain species naturally offer broader environmental benefits that garner them greater support among sustainability advocates. “The biological nature of shellfish allows them to be an asset to the environment because they are filter feeders,” said Branchina. This trait allows them to improve water quality. 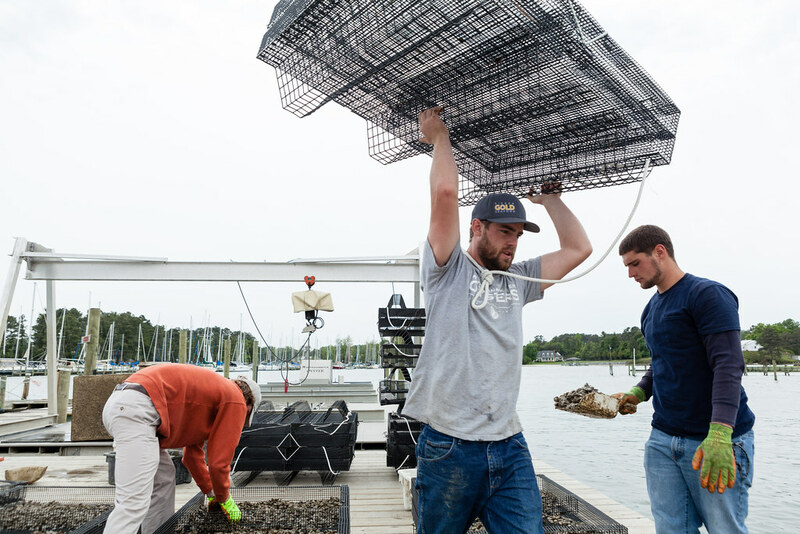 With such businesses, environmental sustainability “isn’t necessarily a factor” in lending decisions, “but definitely an asset to the appeal of shellfish farming,” he said. On the other hand, farming operations for fin fish (as opposed to shellfish) raise more sustainability concerns. “Exceptional densities of salmon are often raised in net-pens. They produce waste in the process which collects at the bottom. So there has to be strict diligence in monitoring that,” said Branchina. This monitoring is important because net-pens allow open exchange of waste with the ocean, which when not properly managed can have negative impacts on biological diversity around the seabed. In addition to incorporating sustainable practices, aquaculture businesses face the added challenge of attracting investments into a relatively young sector. “If you have something that people don’t quite understand, the barrier to entry is larger,” said Velings. While Aqua-Spark continues to grow (they currently have over 80 million Euros under management), the fact that this type of fund has “no comparables” can make new investors “a little hesitant,” he said. Krome from Hatch and Alimentos Ventures points to a lack of investor education as an obstacle to attracting more investment. The aquaculture industry as an asset class is “new, and that always scares most people,” he said. In addition, the industry is fragmented, with many smallholders, making it difficult to attract investors and scale. While the entire sustainable aquaculture supply chain needs increased investment capital, certain aspects of the industry require even more resources. More information transparency across the supply chain would enable investors to better identify sustainable interventions and avoid supply-demand mismatches.